He views this as the ultimate compliment because of his focus on imparting thought leadership – clear and rigorous thinking that drives excellence in action. Through experiential learning and vibrant, analytical class discussions, Subramony prepares each of his students to be not just the smartest person in the room but actually to be a thought leader. His teaching approach is engaging, involving a mix of case discussions, role playing, data collection and analysis, and discussions on theory. He encourages his students to work through problems and dig beneath surface issues – for example, how to increase employee retention – to more systemic issues, such as how a company’s culture leads to employee turnover. It is this attention to engagement that generates enthusiasm and energy, hallmarks of Subramony’s teaching. Because Subramony believes students learn what is relevant to them, they discuss the personal implications of key management theories and findings. For example, in his training and development course, students participate in a 360-degree feedback process and work up personal development plans. Experiential learning also creates relevance. To that end, in Subramony’s management consulting course, students work in consulting teams with public and private sector clients to diagnose and solve organizational problems. Recent graduate Adrian Mascote worked on a project in which he and his teammates were charged with building a program to onboard top-level executives to new roles at Caterpillar. After designing, administering and analyzing the results of an extensive survey, his team provided recommendations to the leadership at that company – most of which were accepted and implemented, Mascote said. The class was involved in every step of the process, with Subramony acting as an engaged coach. “He’s the type of professor who guides you. It was like you were at an actual consulting firm. He was open to suggestions. He was never forceful. He let you veer off a little bit, but would say, ‘Maybe look at it this way,’ ” Mascote said. In addition to teaching courses, Subramony conducts research in strategic human resource management and customer service. 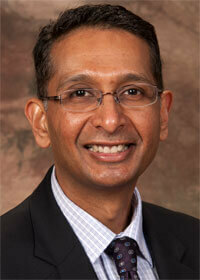 He is also the associate editor for the Journal of Service Management. Additionally, he is director of NIU’s Center for Human Capital and Leadership which provides a wide range of analytics and consulting services aimed at improving organizational effectiveness. Through this work, Subramony pursues his interests in identifying and fostering cutting-edge research, and keeps current on business trends. 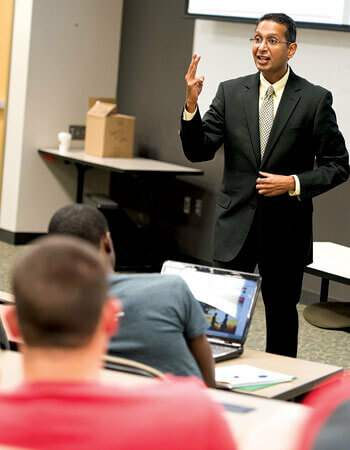 Educating students to become thought leaders is important as the workforce changes, Subramony said. Subramony’s teaching practices represent what NIU’s College of Business stands for, Dean Denise D. Schoenbachler said.